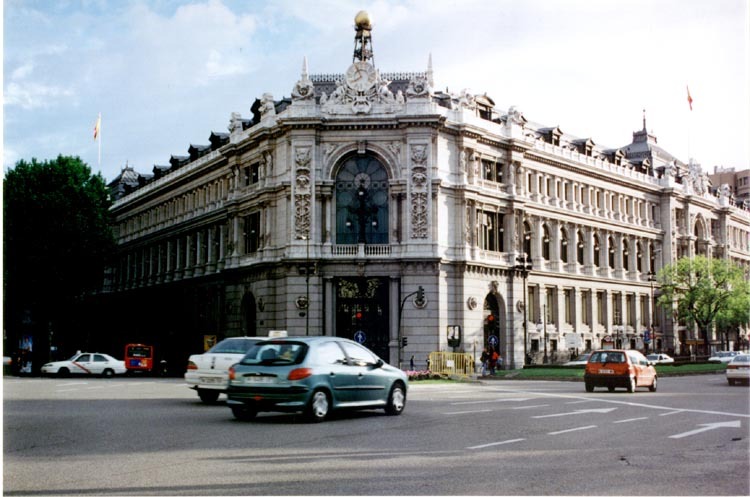 The headquarters of the national Bank of Spain is housed in a colossal building occupying a whole block. It is in one of the most central positions in Madrid, at Plaza Cibeles, in full view of the Cibeles Fountain, and on the corner of the Paseo del Prado. Work was begun on the building in 1884, when King Alfonso XII symbolically laid the first stone, and the work was designed by the Bank's own architects Severiano Sainz de la Lastra and Eduardo de Adaro. The site had previously been occupied by the Marquis of Alcañices' palace, which had been demolished, and the Bank's new building was inaugurated in 1891. The staircase in this part of the building, which leads from the Paseo del Prado entrance, is made of Carrara marble, and was made by Adolfo Areizaga of Bilbao to a design by the Bank's architects. An impressive library and reading room for research purposes is also situated in this part of the building, and contains a magnificent collection of over 350,000 works pertaining to finance and the economy, including documents, books and periodicals. Cards and temporary cards are issued to legitimate researchers for use of the library's resources, and it is open on weekdays from 8.30am to 5.30pm, except in August when it is open from 8.30am to 2pm. With the acquisition of more land on the same block in 1927, the Bank began a further extension, once again designed by its own architect José Yarnoz Larrosa. He used the existing styles to provide the exterior work, and only gave way to contemporary innovations on the inside of the building. These include Art Deco features in the stained glass ceiling of the operations patio. Further extensions were built in different styles, notably between 1969 and 1975, and then again in 2003 when the final plot of land on the block was developed and incorporated into the overall building. This final part was designed by the architect Rafael Moneo. The building also contains important art works by Goya, Sorolla, Mengs and Maella, but admission to the paintings and the interior of the building is by appointment only (write to Servicio de Protocolo, Banco de España, Calle Alcala 48, or phone +34 91 338 5365, or email comunicacion@bde.es). On the other hand, the outside architecture as viewed from the street is worth a visit if you are walking around this central part of Madrid, and you can combine it with a visit to the Prado or Thyssen-Bornemisza art galleries. The nearest metro station is, logically, Banco de España.